These Winter Work Gloves are the best in the industry for snow plow contractors. 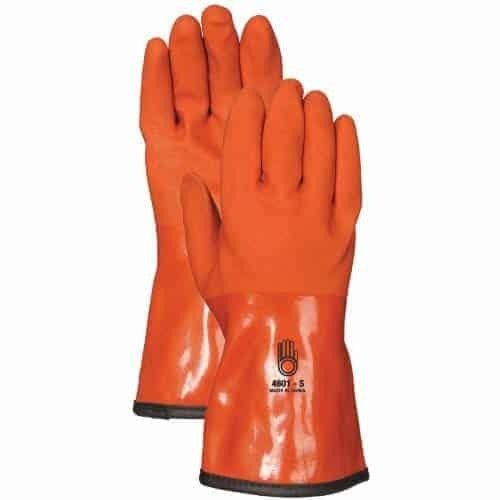 They have a waterproof and texturized double dipped PVC coating that keeps hands dry and stays flexible to -4°F. The ultra soft fleece liner adds warmth and comfort. They are also machine washable for easy maintenance and they fit easily over your wrist. Double-dipped PVC coating provides strong protection. Rough texture provides grip and increases abrasion resistance. Extra long coverage to forearms to protect from oil and chemicals. Snow & Ice Salt & Chemicals Unlimited, LLC is a leading supplier of ice melt, decier and snow removal tools with locations in Bethesda, Silver Spring and Cambridge, Maryland. We are open 24/7 before, during and after every snow and ice storm. Our snow removal customers are usually located in Washington DC, Maryland, Virginia, Delaware, Pennsylvania and West Virginia but ice melt can be shipped in truckloads to anywhere in the United States.